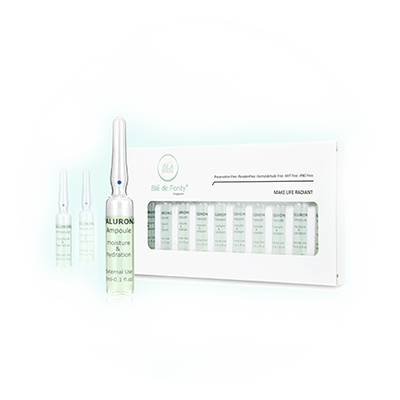 HYALURONIC AMPOULE-MIRACLE AMPOULES-Ble de Fonty. 1.Locate the BLUE DOT on the ampoule bottle. 2.Apply pressure on the BULE DOT to break the bottle.Trying to break the bottle at other parts may cause injury to user. 3.Fix the nozzie on the bottle,remove the nozzle cap and gently squeeze out half a bottle of the ampoule. 4.Apply the ampoule on the cleansed face and gently massage the face until the content is fully absorbed. 5.Cap the nozzle and store the unused bottle of ampoule in a cool place away from direct sunlight.Refrigeration is fine though not necessary. 6.Continuous use will resuit in your skin becoming tender,smoother and radiant looking.